By doctoring the mileage twice, unscrupulous sellers can dupe buyers and fool NCT checks, says the AA. THE AA HAS warned prospective car buyers to be wary of a scam whereby unscrupulous sellers significantly lower the mileage on a car to it can pass its NCT, before raising it slightly to get a good sale price afterwards. This “lowballing” scam would lead motorists to being duped into paying over the odds for cars that have significantly more mileage on the clock. This is “harder to detect than simply reducing the mileage”, according to the AA. Joe Langan, from AA Car Inspections explained: “During one recent inspection, where a customer was interested in buying a three-year-old car with 30,000 miles previously registered in the UK, a background check found that the car’s mileage had been recorded as 18,000 miles during its first MOT (UK equivalent of NCT) 90 days earlier. “So we were expected to believe that this car had taken nearly three years to do 18,000 miles – and then driven over 130 miles per day for the last three months. 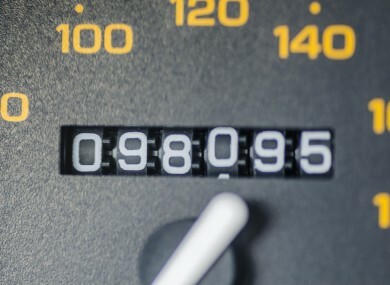 This just does not add up – we suspect someone had decided to turn back the mileage on this car – perhaps dropping it from 60,000 miles – but decided to ‘lowball’ it first, down to 18,000 miles, to ensure a low base mileage was recorded during the first MOT, from which they could then adjust the mileage to something more realistic when selling on. The AA said it had come across a number of instances such as these from UK-imported cars as part of its car inspections service. By doctoring the mileage twice, it gives the seller a bit of leeway to bring the car’s mileage towards something that appears more realistic before selling on, the AA said. Its director of consumer affairs, Conor Faughnan, commented: “While it can be easy to think that you may have snapped a bargain, sometimes a good deal is simply too good to be true. Before buying any car it’s important to have it checked out by your mechanic… as it’s only during this step that doctored mileage or hidden damage to the car is likely to be detected. Email “AA warns car buyers about new mileage 'lowballing' scam”. Feedback on “AA warns car buyers about new mileage 'lowballing' scam”.